Most bakers love bite-sized things. They’re just irresistible to make. There’s something about seeing a small army of pastries, all properly lined up on baking sheets waiting for their time in the oven. And when dressing, rolling, cutting or stuffing, there’s a strange pleasure to be found in doing the same thing for each one of the small baked goods, trying to get them as even as possible. (Or maybe I’m slightly obsessive and find this satisfying…). But who can deny the appeal of a basket filled with bite-sized treats? No one. And I’ll tell you why; if you had a basket of regular-sized croissants sitting on your breakfast table, the most you could grab in one sitting, without losing face in front of your breakfasting companions, is one lonely piece. And pushing it, you could eat half of this piece with one topping and the other with a different one. But if you have a basket full of mini-croissants… the possibilities are endless! Because no one will judge you if you spread nutella on one, take another one and smear some butter and marmalade on it, take a third one and dip it in your milk, or even if you take a fourth one to accompany a little bit of ham and cheese you had left over on your plate. That’s the beauty of bite sized. Small pastries just keep telling you to eat them because they know they’re so small that what could be the harm in just one more? And they’re absolutely right. Such is the case with these fluffy, buttery, cinnamon stuffed mini-brioches. It’s like just eating the center of a brioche-a-tete several times over. Because once you have one you will have to have a second one and quite possibly a third one. And that’s ok. No one will judge you. So maybe you’re one of those people that frowns upon having cake for breakfast. (Although I doubt it, since you’re browsing a blog with food pictures with something about decadence in the title) If that is the case, don’t leave yet! I have the perfect excuse to have donuts for breakfast. That’s right, you can now indulge in those tiny glazed treats before 9 am, because how could you not? They’re french toast flavored. And since french toast is a universally approved breakfast food, I think my argument is won. And if you’re not convinced I can just tell you how incredibly well these go with a quick espresso. Which is basically taking a to-go breakfast from you coffee house chain (*cough*starbucks*cough*) to the homemade goodness level. 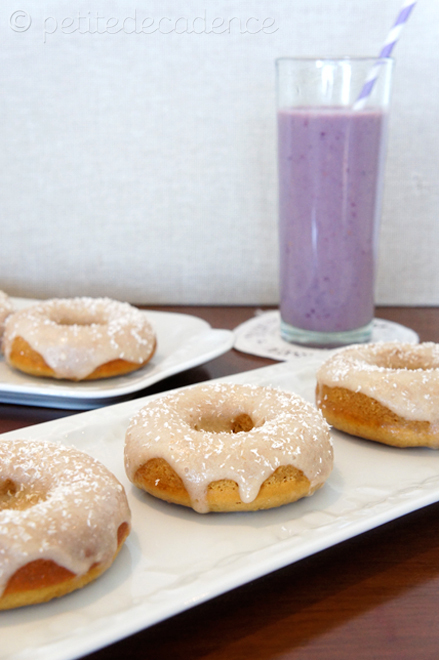 Because we’re talking baked donuts, (not fried!) maple syrup, vanilla, cinnamon and a double glaze. With a tad of cream, in case you were missing that from your complete breakfast. Fluffy and morning like, they’re also the perfect treat to bring to your office in case you’re incredibly late. Because you were glazing donuts, maybe. But no one will get angry if you offer them one of these. Right? Read more for the recipe. Yesterday I came home and popped into my laptop Rossini’s Barbieri di Seviglia (I know, I’m getting stranger by the day) and then set on to search for a classic french onion soup, which I did not have to do for long since Smitten Kitchen, as usual, had the answer for me quite soon. 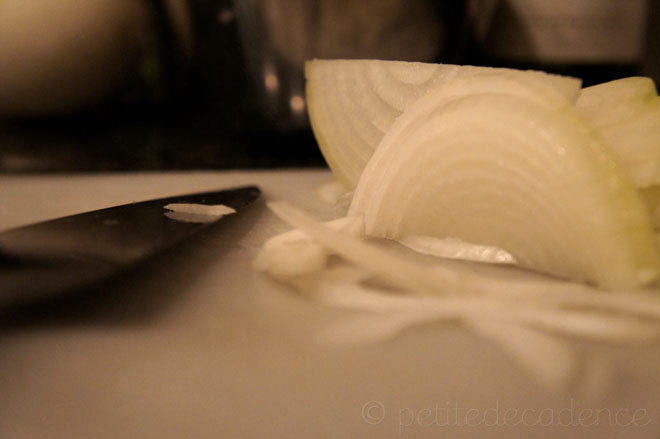 So I grabbed 4 big, shiny, smooth onions and set them on the chopping board. I grabbed the knife, I sliced once, I sliced twice. And then I stopped. What on earth was I thinking???? I’d completely forgotten that onions, or any of their cousins (red onions, shallots, garlic, spring onions, chives, you name it!) will have me in tears within seconds. And I’m not talking about watery eyes or a runaway tear. I’m talking grab-the-tissues-now stuff. I don’t know why so much, but it’s always been that way. I’ve tried super ultra sharp knives. I’ve tried cold onions straight from the fridge. There’s nothing that can help it. 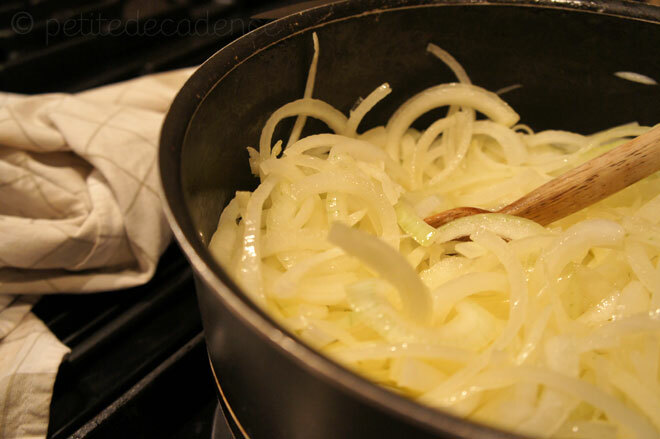 In fact, I remembered as I held the onion with great hatred in my hand and cried in between bouts of Figaro Figaro Figaro coming from my computer, when I worked in cooking school and I had to prepare for recipes which included onions, I would always trade with the other assistants for anything else. I’d much prefer to remove the scales from your smelly fish! So why would I subject myself willingly to all that slicing of the stinky critter?? 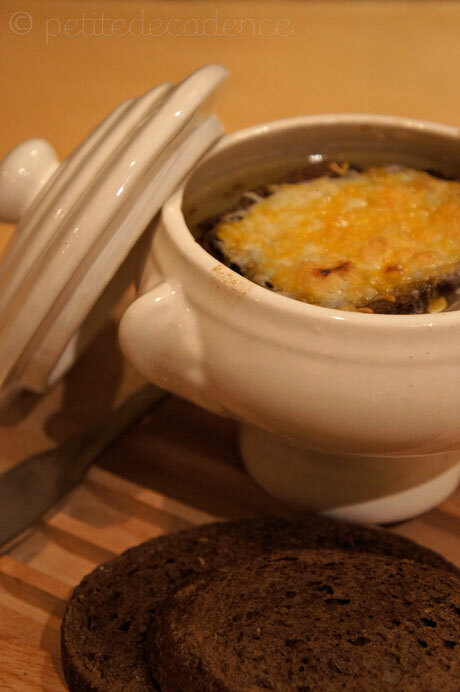 The reason, of course, is that there is nothing quite like french onion soup. Even if I had to eat it with puffy eyes and a red nose. 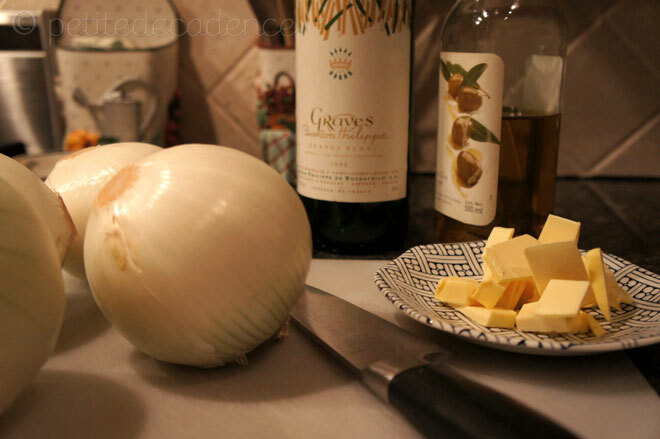 Deb uses Julia Child’s recipe, which she kindly provides with friendly measures. The only thing I changed was the bread, which I changed for American pumpernickel since I didn’t have any other, but it was actually an incredibly good twist. 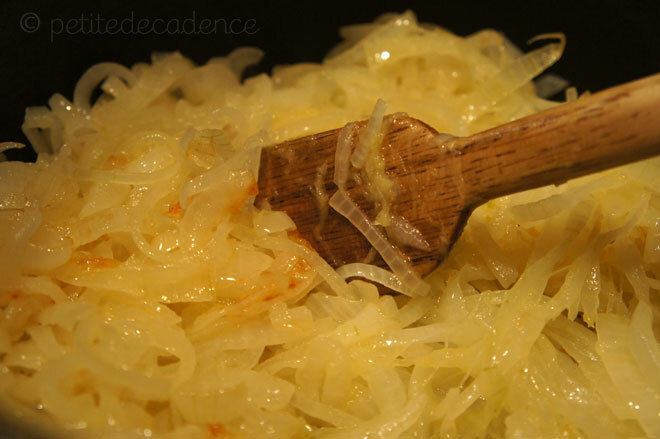 The caraway seeds such a pleasant surprise in the hot, caramelized goodness of the onions.